We have an exciting new bloodline from an Island just off shore from Nova Scotia sent to me at 4 months old. It all started with a Lady that e-mailed me 3 years ago & asked if there could possibly be Indian dogs in that area. I told her that it could be a good possibility & to send me pictures, as she pretty much described them as looking & acting like our AIDogs. After seeing pictures & asking questions as to there personality I was almost positive these are pure or close to pure Indian Dogs that are feral on this island. Luckily there are no coyotes, wolves, lost hunting dogs ; (as hunting is illegal & the Island is part of a reserve) or dumped stray dogs on the Island for them to have crossed with for many years now. Yet the Island is large enough for them not to have done too much inbreeding … being a primitive instinctive type dog they do this naturally. Even in my compounds the breeding males & females know naturally who they should breed with & who they are related too. Although the related one’s try to push up in the ranks to continue their genes on into future generations & push down the one’s that are not related to discourage those genes. Her family has a cabin on this Island & they all have spent time there for many generations, enjoying & feeding the dogs. From as far back as she can remember they have made friends with these feral dogs that live on the island & they have become pretty friendly with locals & campers. I’ve researched the local First Nations peoples Huron dogs years ago & had already found some back then, so I knew what to look for. I feel I also confirmed that they are the old dogs through a forest ranger she got me in touch with that lives on the Island all year around. 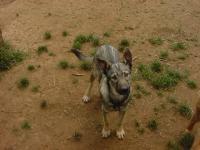 The forest ranger has adopted a few of these dogs as his own through the years & knows there personality’s very well. He was happy to send me a pup as he keeps a close eye on what packs are having pups & where & try’s to keep the population at a point that keeps the ecological animal life in balance & in check on the Island, as they live on the small game that is abundant there. This type of Indian Dog is more of the Nordic type that are the ancestors of the Icelandic Shepherds, Chesapeake bay Retrievers, Nova Scotia Duck trolling retrievers & some of the smaller modern hunting type Inuit dogs. Another type also branched off … bred to bigger modern larger husky type sled dogs for pulling, some times called Inuit sled dogs or mixed with large modern Malamutes. These are very similar to the camp dogs that could still be found in upper main as late as the 1930’s used as all around farm dogs for herding, hunting & pulling sleds on farms at the time, we have pictures of these camp dogs from the Mohawk in upper Main on the “History of the AIDog” page. This was before they were crossed so much with European hunting dogs & pretty much assimilated into registered & un-registered modern back woods working type dogs that we can’t really call breeds at this point. These types of small Nordic Indian Dogs were originally developed by the North Eastern tribes … Iroquois; (as seen on Bill Pferds book), MiqMak, Mohawk, Huron, Hare … etc. They were referred to as the Hare ; (when longer haired types) or small Common Indian Dogs found from eastern Canada, Nova Scotia, Iceland, Greenland, & down the Eastern U.S. Used mainly for forest hunting & swimming & all the usual work that all the AIDogs did. They probably had a lot of the old Viking collie dogs, puffin dogs or Lundhunds in them also from one to two thousand years ago when the Vikings hunted, traded & settled the area & brought there dogs with them. These dogs have the primitive large webbed front paws like the old Indian dogs & Norwegian Lundhunds did for swimming & digging after ducks & puffin birds out of there holes & for climbing for forest hunting. This is why most new puppy owners think there pups will end up much larger than they appear when pups (there big feet <g>) … even bigger than the other types. Plus they have that double jointed thing that all the old Indian dogs all had & still have today. Here is Nova a silver/gray male at 6 months old … a very typically sweet boy that fits right in with the pack & breeding program of American Indian Dogs & a great addition to our breeding program ….. & a very good example for the people that still think the Indian Dogs of the America’s are extinct or merely made up of mixing modern mutts together. Very natural, selectively bred Indian dog mutts & proud of them <g> & Nova is just a small part of that balanced recipe, we call American Indian Dogs. Wow thats a beautiful animal. Is it too early to tell if the behavior fits right in line w/ the other AIG's? Actually, Kim wrote this last February, and I only put it up this Summer, so we've already had a couple litters down this line, and you are right, they are gorgeous, and fit right in with the rest of them. I am only asking this b/c I have not yet talked to Kim but I'll go out on a limb here. Please forgive me AIDogenese verbage its a little lacking so I'll try to describe this as best as possible. I understand that there are differences between the various regions of the dogs and their confirmations 'pre-columbian'. In this day and age w/ all the great work Kim did bringing them back from the brink of extinction yields more of a Plains type...correct? and as he back breed then alot of the other dormant traits come out...correct? This one tho he said may have had alot of nordic influence (even if its couple 1000 yrs back) still looks like it has alot of that old village/common stockiness. I must confess I am more drawn to this 'type' more so than the longer more refined lookin ones. Seems some are sleek like a coursing type and others are stouter like a dog meant more for pulling and sledding. Right. There are also some that are very short haired, and others with a thick coat--all those differences that you see on his website. Sometimes litters will have all the different colors and variations, other litters will look very similar, and sometimes he is breeding for a certain type, to be sure it is still in the mix. I'll send your question on to Kim, for a much better answer.